I received an email today asking me about Saltair and its history, and it got me thinking a lot about it again. I am absolutely FASCINATED with the history of Saltair, and if I believed in past lives, I would be convinced that I frequented the original Saltair in the late 1800s, early 1900s. It is absolutely fascinating to me! If you have any questions about Utah history, or anything about Utah, feel free to email me any time at contact@enjoyutah.org. I would love to answer your questions, and point you in the right direction. Reader Question: Yesterday I came across your web site. I think it is really cool. I have lived in Utah my whole life and I want to see more of Utah. I have a question about Saltair. I have heard of it, but recently I have become more interested in it. I want to see the site of where the original Saltair was. Do you have any advice on how to find it and what to look for? Thank you for your time. Do you know where the current Saltair building is? If you go there, then get on the frontage road and head Eastbound. The original site of Saltair is approximately 2.2 miles East on the frontage road from where Saltair stands now. One thing you used to be able to look for is an old broken down railroad car, but they recently cleaned that up. Old slides from the waterslide that used to be there have also been cleaned up and trashed. So sad that so much history has just been thrown away. When we went on a “treasure hunt” there a few years ago, we found old dishes dating back to the 1920s. It was so fascinating to me because my Great Grandmother, who came to Utah from Denmark, used to take the old train out to Saltair for their big dances, and used to eat at the Ship Café. Those dishes could have been ones that SHE personally ate off of. SO cool! In the 1920s, a fire burned down the Ship Café, and all of the furnishings and dishes went underwater. Because of the low water levels now, all of those dishes are just sitting in the sand. You don’t even have to look for them…..they are everywhere! SO fascinating to me! When Saltair II burned down, the last and final one was Saltair III, and that’s the one that stands today. It was relocated from another part of Utah, and is an old airplane hanger. Let me know if you have any more questions. 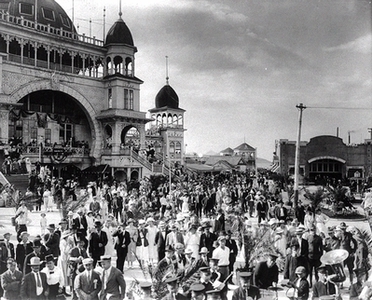 I think in my “past life” I was a lady who frequently visited Saltair during its glory days and attended dances there. ;) My Grandma talks a lot about the old roller coaster that used to be there, and how “wild” it was. It was the wildest roller coaster in all of America, according to many people. There was also an old merry go round there. My grandma also recalls the dances they used to have there. Popular bands like The Glenn Miller Band and Nat King Cole performed there. Like I said, I could go on for HOURS about Saltair history. This is my favorite part of Utah history, and it amazes me there isn’t some kind of monument or museum celebrating it. I too am fascinated by the history of SaltAir. I wonder why it was so easily abandoned, and why Lagoon was successful. I guess lake stink was the death of Saltair. Either that or fluctuating lake levels really were responsible. I love to see the old photos of people partying while they float in their bloomers out on the lake! My father-in-law talks about going out on the party boats on Utah Lake before Geneva Steel came to town and it sounds so fun! Definitely an era gone by I'd love to have lived in.